The Inuit word for wolf seems even more apt now, as Volkswagen’s facelifted Amarok pick up looks to establish itself as leader of an increasingly ravenous pack in 2017. Who’s crying wolf now? That would seem to sum up the universal reaction to the somewhat surprising news that the sector has its first ever six cylinder model. 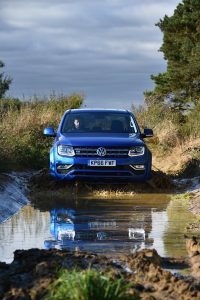 Replacing the previous 2.0 litre TDI version, the revamped Amarok has at its heart a new EU 6 compliant 3.0 litre V6 TDI engine, delivering unprecedented levels of power – 224 PS and torque – 550Nm. All this is channelled through a standard eight-speed automatic gearbox, giving a car like top speed of 119mph and 0 to 60 in eight seconds. This former pack animal has unashamedly gone native as it aims to carve out new hunting grounds for itself in this increasingly dog eat dog sector. Interestingly, given this enhanced power, and thanks in large part to the standard Bluemotion technology modifications, including stop/start battery regeneration and modified engine design, the 224PS Amarok claims to return a very respectable 36 mpg on a combined cycle and CO2 emissions of 204 g/km. Other manual variants will follow later in the year as well as more competitively priced 161 ad 201 bhp options. 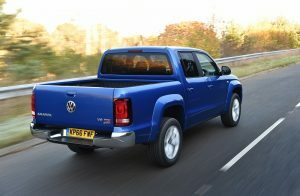 Outwardly the latest Amarok has been bought into line with other LCVs in the Volkswagen stable with a new front bumper and radiator grille design including front fog lights, new alloy wheels and a third brake light with LED technology. Horizontal lines dominate the front end with much cleaner looking angled folds and edges. Significant changes inside the five seater double cab are also apparent, with an all new dash panel design which incorporates an MIB infotainment system with touchscreen, radio, navigation and new technology, including the option of guide and inform Car Net and App connect systems. Bluetooth and DAB Digital radio are now standard features as is a comprehensive list of safety features. This includes four air bags, ESP and the company’s much celebrated Automatic Post Collision Braking system, which can reduce the chance or severity of a secondary accident in the event of a prang. Additional highlights include Park and Pilot and a rear view camera also enhance comfort, convenience and safety. Under the skin, the vehicle’s running gear remains fundamentally unchanged from the previous generation, which enjoyed sales of just under four thousand in the UK during 2015, an increase of around 25 per cent on the previous year. Previous dimensions are also largely retained, measuring 5.2m long, 2.23m wide and 1.83m high, meaning it can uniquely accommodate a Euro pallet sideways. Payloads range from 1,112 to 1,154 kg with gross vehicle weight from 3,080 to 3,290kg. New customers will be able to choose from selectable (with manual gearbox) and permanent with auto 4 Motion Wheel Drive with optional mechanical rear axle differential lock for demanding off road use. With prices starting at around £27,000 (excluding VAT) VAG firmly believes that there is extra mileage to be gained from remaining resolutely at the premier end of the segment and appeal to customers who want to combine business during the week with a car like driving experience at the weekend. To this end no-one could ever accuse this particular wolf of hiding in sheep’s clothing. 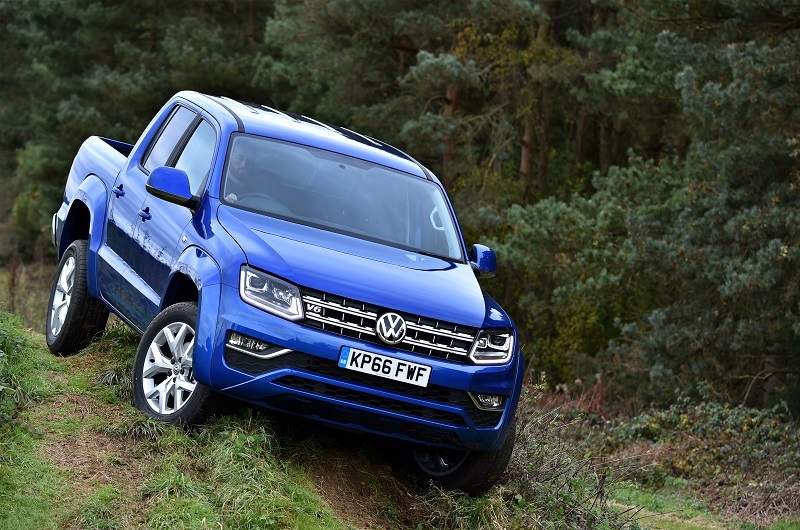 For further information on VW Amarok click here.